Pawpaw farming is delicate, and it requires one to be sure of the best variety that does well in his/her area. There are different pawpaw crops grown today but we will only filter he few important ones in Kenya. This variety originated in India where it is known as Madhu Bindu. It is gynodioecious (some trees have female flowers only and others have hermaphrodite flowers only) in nature and semi-dwarf growing to a height of about 2 meters. On average, its fruits weighs about 1.5 to 2kg and they are dark in clour with some ridging on the surface. Fruits from hermaphrodite trees are elongated and oval while those from female trees are ovoid. The fruit pulp is yellow in colour. This variety yields about 70 kg per tree (about 35 fruits). The Pusa variety just like the solo variety has many strains developed from it. The Pusa Dwarf pawpaw is a dioecious variety (the males and females are separate plants). The trees are dwarf plants that produce medium-sized oval fruits that weigh 1 to 2 kg. The plant starts bearing fruits from 25 to 30 cm above-ground level and is comparatively drought hardy. This variety is very suitable for high-density planting hence best for backyard gardening. The Pusa Giant variety has plants that grow very fast, are sturdy and tolerant to strong wind. The tree grows to a height of 4.7 to 6 m. This variety is also a dioecious variety with big-sized fruits of between 2.5 and 3 kg. Its fruits are very suitable for canning. Pusa Majesty is a gynodioecious variety (the plants are either female or hermaphroditic). This variety is tolerant to viral diseases and root knot nematodes. It is suitable for papain production and is comparable to C0.2 variety for papain yield. The fruits are medium-sized weighing between 1 and 1.5 kg, have a round shape and a relatively high quality in terms of self-life. It starts fruiting about 5 months after planting. Pusa Nanha also known as Mutant Dwarf is dioecious variety, dwarf and precocious. Its fruiting starts at a height of 40 cm within 239 days of planting (approximately 8 months). The tree attains a total height of about 130 cm. The fruits are medium to small with an oval shape and a red to orange flesh that is 3.5 cm. Pusa Delicious is another gynodioecious variety with medium to tall plants. It starts yielding 8 months after planting and has good quality fruits. The fruit is medium-sized weighing between 1 and 2 kg. They have a deep orange flesh having with excellent flavour. It is grown as a table purpose variety and is also very high yielding. The Solo variety is valued for its productivity, uniform fruit shape and size, and excellent fruit quality. Most of the trees of this variety are hermaphrodite which means the flowers are self-pollinated which produces uniform fruits. The solo fruit is round and shallowly furrowed in female plants and pear-shaped in bisexual plants. The fruits have a yellow-orange pulp and weigh between 0.5 to 1kg. The Sunset Solo is a small to medium-sized, pear-shaped fruit. It has an Orange-red skin and flesh which is very sweet. Its tree is a dwarf but high yielding plant that was developed at the University of Hawaii. The Vista Solo variety is a medium to large fruit depending on climate. Its fruit has a yellow skin and orange to yellow-orange flesh. It is hardy, compact and of high quality. This variety needs fairly hot weather to develop sweetness. Its flowers are self-fertilizing. It was developed in Vista, California by Ralph Corwin. The Sunrise Solo variety is the most popular in Kenya and other countries. It has a reddish-orange firm flesh smooth skin, and a high sugar content that makes it sweet. Its plant grows fast maturing and fruiting about 9 months after transplanting, at a height of about 3 feet. It has a hard flesh compared to most pawpaw varieties hence giving it a longer shelf life. It is for this reason that it is preferred for export. It is also adaptable to many climatic conditions, tolerant to viral diseases and its trees are either female or hermaphrodite hence each tree in a plantation bears fruits. How well-planned are you for tree fruit farming this season? The CO-1 variety is selection from the Ranchi variety done by Tamil Nadu Agricultural University in Coimbatore, India. The plant is a dwarf, producing the first fruit at a height of 60 to 75 cm from the ground level. Its fruits are medium-sized, round and have a smooth greenish-yellow skin. The fruit flesh is orange-yellow, soft but firm. It is moderately juicy with good keeping-quality. The fruit is liked more since is does not have the rather unpleasant papain odour. The CO-2 variety is a strain purified from a local variety in India at Agricultural College and Research Institute of Coimbatore. It is a dioecious variety with good papain yield of about 4 to 6 g per fruit. Each fruit weighs about 1.5 to 2.0 kg. The fruit contains 75% pulp with a pulp thickness of 3.8cm. Fruits are oblate and large in size with orange coloured flesh that is soft but firm. It is a dual purpose variety for fruits and papain extraction. The yield ranges from 80-90 fruits per tree. The fruits contain 8.93% reducing sugars and 9.01% total sugars. The vitamin C content is 50.8 mg per 100g. The papain yield is 250 to 300 kg per hectare. The CO-3 is a hybrid derivative of the cross between CO.2 (female parent) and Sunrise Solo (male parent). It is a gynodioecious type with most flowers being hermaphroditic. It is suitable as a table variety. The fruits are medium sized with red flesh. The mean fruit weight is 0.5 to 0.8kg. Fruits are pyriform in shape and they exhibit all the desirable characteristics of the Sunrise Solo Variety. The tree yields 90 to 120 fruits in a year. The CO-4 variety is a hybrid derivative of the cross between CO.1 (female parent) and Washington (male parent). Fruits are medium sized weighing 1.2 to 1.5kg. It is a dioecious type. The fruits have a flesh that is yellow with purple tinge. The tree has purple petiole and stem. This variety is suitable for home gardens. The tree yields 80-90 fruits per annum. The CO-5 variety is a selection from Washington type. It is a dioecious type suitable exclusively for papain production giving 50-60g of wet papain (about 14.45 g of dry papain) per fruit. It is suitable for growing in all seasons and all soils with good drainage. It yields 75-80 fruits per tree with an average yield of 1500-1600kg of dry papain per hectare. Each fruit weighs about 1.5 to 2.0kg. The CO-6 is a selection from a giant papaya. The plants are dwarf and dioecious. First harvest can be had in 8 months after planting. It is suitable for papain production giving 7.5 to 8.0g of dry papain per fruit. It is also used for table purpose. It yields 80 to 100 fruits per tree annually. The fruits are medium sized each weighing 2kg with yellow flesh. The CO-7 is a gynodioecious variety in nature developed through multiple crosses and purified for over four years. The parents are Pusa Delicious, CO-3, CP-75 and Coorg Honey Dew. It is superior to CO-3 papaya in many aspects. The first bearing height is about 52.2 cm. It produces 65-70 fruits per tree annually with a total average yield of about 340.9t/ha, which is 45.96% more than CO-3. The fruits are oblong in shape with an attractive and firm red flesh. The crop has an economic duration of 21 months. There are no serious insect pests. 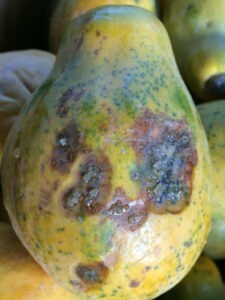 It is susceptible to foot rot, collar rot and powdery mildew like other papaya varieties. It can be grown in plains as well as up to an altitude of 1000m above MSL. • The CO-8 variety is a dioecious strain derived through improvement of CO-2. It has a red pulp and is suitable for dessert, papain production and for and processing and canning. The crop has a production period of 2 years with an average yield of 200 to 230 tonnes per hectare. This is an improved pawpaw variety grown mainly for table purpose. The trees are fairly vigorous with tall stems, purple rings, dark purple petiole growing darker towards the lamina and yellow deep flowers. The male and female plants are separate. They produce medium to large size fruits of about 1 to 1.5 kg in weight. The fruits have an ovate to oblong shape having a distinct purple colour ring at its top connected with the fruit stalk. The pulp is yellow-red, very sweet with an agreeable flavour of fine consistency and free from the disagreeable papain odour, making it a most popular variety. The fruits have few seeds and good keeping quality. • While there are quite a number of strains of the Taiwan pawpaw variety, the hybrid Red Lady is the most popular. This strain is an early and very productive fruiter. It is best suited for gardening and can be grown both in the tropical and higher latitude lands. It starts flowering after about 70 days from planting. It sets fruits at a height of about 60 to 80 cm and produces large fruits of an average weight of 2 kg. Each tree produces more than 30 fruits per season. The Red Lady is a self-fertile hybrid whose fruits have an orange-red pulp that is sweet and juicy when ripe. The fruits are rich in vitamins A, C and other nutrients. You will notice a sweet, delicious aroma when it is fully ripe. If you are in need of pawpaw seeds or seedlings contact us and we will guide you!. The plants grow in three sexes: male, female and hermaphrodite. The male produces only pollen, never fruit. The female produces small, inedible fruits unless pollinated. The hermaphrodite can self-pollinate as its flowers contain both male stamens and female ovaries. The optimal temperature range for pawpaw in Kenya is between 25°C and 28°C, and production normally peaks between August and October. Pawpaw grow and produce well on a wide variety of soil types. Under favorable conditions, the root system can penetrate to a depth of 2m, but most of the roots responsible for nutrient uptake are found in the top 500mm. Correct irrigation is crucial. This starts with good drainage. Pawpaw roots will die off in over- saturated and poorly drained soil. Impermeable layers will hamper growth and production and can lead to root diseases. Pawpaw grow best on a slight slope, which enables the runoff or drainage of excess water and prevents waterlogging. Soil depth: Under irrigation, pawpaw grows best in soil with an unimpeded depth of more than 1m. However, if irrigation is well-planned and managed, there should be no problem on soil with an unimpeded depth of 750mm, if drainage is good. Texture: The ideal soil for pawpaw cultivation under irrigation is a sandy loam or loam soil with a clay content of 15% to 30%. Soil with a clay content of up to 50% is also suitable. In very sandy soil, temporary over-saturation might occur when soil compaction or impermeable layers limit drainage. Sandy soil (less than 10% clay) normally has a very low water-holding capacity and nutrient status. A mulch or application of organic material can greatly increase the potential of such a soil. Seek expert advice here. Soil structure: The ideal soil has a loose, brittle, crumbly structure. Soil pH (water): Pawpaw grow best in soil with a pH (water) value of 6 to 6,5. If soil exchangeable aluminum (Al) is not more than 30ppm, a soil with a pH (water) of 5,5 or higher may be used. At a pH (water) value lower or higher than the 5,5 to 7,2 range, plants may suffer from trace element, phosphate or potassium deficiencies. Obtain a soil analysis (your extension officer will be able to help you here) before planting. Supply the lime, phosphate and other elements as recommended by the analysis. If lime is needed, incorporate it into the soil six months to a year before planting. If it is necessary to rip the soil, plough the lime in beforehand and then rip afterwards. Some producers prefer to plant a cover crop as a source of organic material. In such cases, plant it about six months before the actual soil preparation begins. For more information about Pawpaw farming, visit our offices. Book your seedlings today as we wait for the long rains. Papaya trees, also known as paw-paws, are fast-growing with a short life span, reaching 15 feet or higher in optimal conditions. Known as either Hawaiian or Mexican varieties, fruit “berries” can be ½ Kg and sweet (Hawaiian) or up to 4.5 Kgs and milder (Mexican). Red Maradol papayas come from Mexico and range from 2 to 8 pounds with edible seeds. The trees are easily grown in containers, but require lots of watering and fertilizer to produce the heavy fruits. Choose a sunny spot for planting the red maradol papaya or placing its container. Provide well-drained soil and a consistent temperature of 70 to 90 degrees in a wind-buffered area. Placing the papaya next to a building offers heat reflection it enjoys, but the tree’s eventual size could be a detriment to the building. Purchase a Red Maradol papaya that is a small tree in a large container, without roots that have circled inside the container with nowhere to go. Look for a tree that is certified as disease-free and appears healthy and pest-free. Plant the Red Maradol papaya tree after soil temperatures have warmed in the spring. Containers can be placed outside after the last frost date, but soil temperatures should remain above 60 degrees for non-container trees. Anchor black plastic over the soil several weeks before planting to raise the soil temperature; once the tree is planted and watered, place the black plastic around it to control soil temperatures until the threat of cold soil has passed. Dig a large hole for the Red Maradol papaya with a spade for planted trees. Make the hole at least 3 times as deep and 3 to 4 times the width of the container to loosen the soil and help the roots expand easily. Partially fill the hole with the native soil and place the papaya tree on top of the soil so that the root ball is level with the rim of the hole; fill in the rest of the hole and gently press the soil down. Water the tree thoroughly at planting, but do not saturate the soil so that the tree is sitting in a puddle, as this could cause the roots to rot. Water the soil deeply and keep it moist as the tree establishes. Mulch around the base of the tree to retain moisture, suppress weeds and even out soil temperatures so that the tree is not subjected to sudden change. Keep the mulch about 8 inches away from the trunk of the tree if it is planted in the ground. Mulching container trees is also beneficial, but depending on the size of the container, mulch may need to be closer to the trunk. Use an organic mulch, such as tree bark or compost. 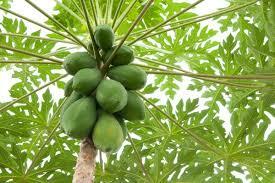 Apply fertilizer to establishing Red Maradol papaya trees every 2 weeks; by 8 months, scale back to once a month. Fertilizing is especially important for container trees, as they are unable to pull any nutrients in from the surrounding soil. Use a commercial granular fertilizer that is high in nitrogen and can be diluted in water; follow the manufacturer’s directions to properly mix and apply. Apply it to the soil, not to the tree trunk or leaves, to prevent burning. Container-grown trees dry out quickly and the tree requires a lot of water for fruit establishment. Papayas do not need pruning due to their short life span. Compost may be added to the native soil during planting, but no more than a 50/50 mix is recommended for the initial planting. The health benefits of papaya include better digestion, relief from toothache, improvement in the immune system and the promotion of better heart health. Papaya also known as paw paw, pawpaw or papaw is also believed to prevent cancer. Papaya, also known as Carica Papaya, is commercially famous for its high nutritive and medicinal value. Fruits like papaya immensely benefit your body. Papaya is a natural source of vitamins and minerals that are essential for the normal functioning of the body. It is famous for the luscious taste and sunlit color of the tropics and has many health benefits. Papaya can be eaten as a fruit, a smoothie, a milkshake, and as a vegetable in raw form. Papaya, a cerise-orange colored juicy fruit is not only fragrant and delicious but also very healthy. Papaya has been famous for hundreds of years and it was once called the “fruit of the angels” by Christopher Columbus. Latex derived from the raw fruit is used as a meat tenderizer and is also used in the manufacturing of several cosmetic, skin, and beauty products, as well as certain chewing gums. They are available for consumption throughout the year. The whole fruit, including other parts of the papaya tree, are beneficial to health in several ways. An enzyme called papain is present in the fruit which helps in the digestion of proteins. 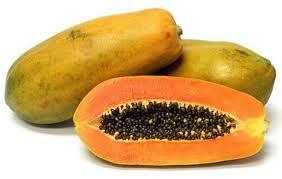 Papaya in raw form contains this enzyme, which is used in the preparation of dietary supplements and chewing gums. Papaya is rich in antioxidant nutrients such as carotenes, flavonoids and vitamin C, as well as vitamin B (folate and pantothenic acid). It is also a good source of fiber and minerals such as magnesium. Together, these nutrients help to improve cardiovascular health and protect against colon cancer. Papayas are commonly used to aid digestion. The presence of papain, a digestive super enzyme, improves digestion by breaking down proteins and also cleanses the digestive tract. This ensures a reduced conversion of protein into body fat. If the protein in our diet is not digested properly, it may cause arthritis, constipation, diabetes, high blood pressure and other related health conditions. Papayas are also good for people who are trying to lose weight naturally. Having a bowl full of papaya as a mid-evening or mid-morning snack is good for health. Papayas are effective for killing intestinal worms, thereby avoiding infections and complications associated with them. A paste of fresh papaya roots can be massaged onto the teeth and gums to give relief from toothaches. The bark of the tree, primarily the inner bark, is also an excellent remedy. (Somonsohn, 2002). Researchers have discovered that papayas are effective against breast, pancreatic and other cancers. A papaya leaf extract obtained from dried leaves produced anti-carcinogenic effects against tumor cells that were grown in the laboratory. It was observed in a study conducted by a University of Florida researcher Nam Dang, and his colleagues in Japan, that the effects were stronger when the cells were given larger doses of tea. 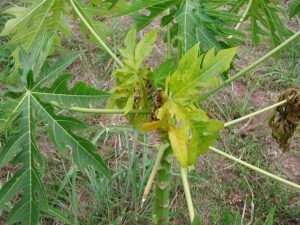 The scientists exposed different types of cancer-affected cells to different papaya leaf extracts and found that the growth of tumors had slowed down in all the cultures. The fruit has gained credibility and has been used in many western medicines for its anticancer powers. The seeds of papayas are good for a healthy heart. Having three powerful antioxidant vitamins, namely vitamin A, vitamin C and vitamin E, means that papayas are helpful in preventing problems such as atherosclerosis and diabetic heart disease. The presence of pro- carotenoid phytonutrients helps prevent oxidization of the cholesterol in the body. When oxidation of cholesterol takes place, it sticks to the walls of the blood vessels and forms plaque that can lead to heart attacks and strokes. Vitamin E and vitamin C obtained from papayas will help in preventing the cholesterol from sticking to the walls, thereby keeping your heart healthy. As a good source of fiber, papayas also helps to reduce the cholesterol levels in the body. Include papayas in your daily diet as a mid-evening snack to keep your heart young. It also helps in treating sores, wounds and ulcers . The latex obtained from papayas is used to treat the areas on the skin affected with acne. The fleshy side of the papaya skin can be used as a mask to cure acne. A diet which includes papayas will help to cure the conditions internally, making the skin clear. Also, when the latex is applied on the burnt area, it helps in reducing the marks caused due to the burn. The enzymes present in papayas, especially the papain and chymopapain, reduce the inflammation in different parts of the body. Macular degeneration is a disease of the eye. In this condition, the ocular cells degenerate, which results in blurred vision and can cause blindness as well. This is an age–related illness and adding papayas to the diet is beneficial for reducing the risk of developing macular degeneration. An antioxidant named beta-carotene gives color to the papaya. Just as carrots help to improve the eye sight due to the presence of beta-carotene, it is also known to be effective in reducing the effect of macular degeneration. According to a study published in the Archives of Ophthalmology, the consumption of 3 or more servings of fruit on a daily basis day may lower the risk of age-related macular degeneration (ARMD). The presence of folate, vitamin C and vitamin E in papayas reduces motion sickness by producing a tonic effect in the stomach and in the intestines. Papaya juice and the ripened form of papaya also help aid digestion. The fiber obtained from the fruit helps to increase bowel movements. Improved bowel movements help to ease the passage of stool, thereby reducing the effects of constipation (Pinoy B. 2010). Papaya juice can be of great help for women with irregular periods. 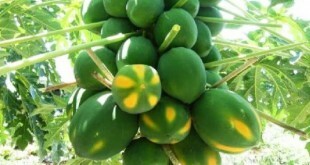 Consumption of green, unripe papayas can also normalize the irregularity in the periodic cycle. Papayas are considered as a ‘hot food’, meaning that it produces heat in the body. This excessive production of heat in the body stimulates the estrogen hormone. This induces periods in the females. Hence, papayas can be beneficial to handle difficult periods. Papayas have been known to be effective against rheumatoid arthritis and osteoarthritis. One of the enzymes found in papayas, called chemopapain, has a significant effect on controlling rheumatoid arthritis and osteoarthritis. Papaya consumption has also been linked to improvement in the immunity system of the body. Research conducted by Hiramoto, Imao, Sato, Inoue, and Mori from Japan is a proof that the antioxidants present in papaya play an important role in improving the immunity system of people. Flowers and roots of the plant have been proven to be beneficial against jaundice, bronchitis, kidney colic and other illnesses. English: Pawpaw; Swahili: papaya. Pawpaw is a widely cultivated fruit tree in the tropics and subtropics. General Benefits of Pawpaw Ripe papaya is a favorite breakfast and dessert fruit that is available year-round. It can be used to make fruit salads, refreshing drinks, jam, jelly, marmalade, candies and crystallized fruits. Green fruits are pickled or cooked as a vegetable. Papaya thrives in warm areas with adequate rainfall and a temperature range of 21-33°C. Its altitude range is similar to that of the banana, from sea level to elevations at which frosts occur (often around 1600 m). However they grow best in areas below 1000 m.
The quality and yield are low at higher altitudes. 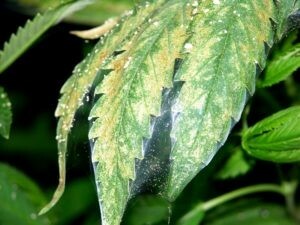 Frost can kill the plant, and cool and overcast weather delays fruit ripening and depresses fruit quality. Fruit tastes much better when grown during a warm sunny season. Evenly distributed annual rainfall of 1200 mm is sufficient if water conservation practices are employed. Papaya grows best in light, well-drained soils rich in organic matter with soil pH of 6.0-6.5. It can tolerate any kind of soil provided it is well-drained and not too dry. The roots are very sensitive to water logging and even short periods of flooding can kill the plants. Papaya is propagated by seed. To reproduce the desired characteristics it is best to get seeds through controlled pollination. Use of sterilized soil minimizes losses resulting from nematodes and damping-off fungi. Germination takes 2-3 weeks. Another practice is to sow the seeds in sterilized nursery beds and to prick out at the 2-3-leaf stage, transferring 3-4 seedlings to each container. Seedlings are transplanted about 2 months after sowing when they reach the 3-4-leaf stage or 20 cm height, preferably at the onset of the rainy season. 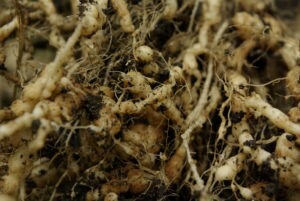 During transplanting, take care not to disturb the roots. Older seedlings recover poorly after planting out. Papaya needs adequate drainage and is often planted on mounds or ridges. Transplants must be watered regularly until they are established. Field spacing are in the order of 3 x 2 m to 2.50 x 1.60 m, giving densities of 1667 and 2500 plants/ha respectively. Thinning to one female or one hermaphrodite plant per hill is done when the plants reach the flowering stage. In the absence of hermaphrodite plants, 1 male plant per 25 – 100 female plants is retained as pollinator. Papaya plants grown from seed produce fruits of different shapes, sizes, colour and even taste. Vegetative propagation of papaya provides a solution to most of these problems. The clone is selected for higher productivity and good quality fruits besides agronomic qualities such as dwarfness for easy harvesting and good resistance to diseases. Planting holes of 2*2*2 ft are prepared with 1 bucket of compost and is mixed in with the dugout soil and returned around the plant. Firm the soil and water liberally and add mulch around the young plant. The farmer can choose to grow the crops conventionally or do organic farming. Papaya grows best when planted in full sunlight. However, it can be planted as an inter crop under coconut, or as a cash crop between young fruit trees such as mango or citrus. Low growing annual crops such as capsicums, beans, onions and cabbages are suitable good inter crops. The stage of physiological development at the time of harvest determines the flavor and taste of the ripened fruit. The fruit matures at 9 months after transplanting. The appearance of traces of yellow colour on the fruit indicates that it is ready for harvesting. Fruits harvested early have longer post-harvest life, but give abnormal taste and flavor. The fruits also tend to shrivel and suffer chilling injuries when refrigerated. The fruit is twisted until the stalk snaps off or cut with a sharp knife. Yields per tree vary from 75 to 150 fruits annually, giving 35 to 50 tons of fruit per ha per year. A papaya plantation can be productive for over 10 years but the economical period is only the first 3 to 4 years. It is therefore advisable to renew the plantation every 4 years. Number of seedlings in one acre at a spacing of 6ft*9ft 800-900 plants.